My website features the best St. George real estate search for homes, condos, land and multi-residential properties available. It is the only site you will ever need! It is easy-to-use and updated by the official MLS database every 15 minutes. St. George, Ontario is an established Village with a smaller downtown core and a variety of home styles ranging from heritage homes, to bungalows and raised ranches. Situated 10 minutes north of Brantford, this area has a population that enjoys small town living while having access to Hamilton and beyond from Highway #6. St. George is a sleepy town, but is geared to community with many events emanating from the local fire hall. 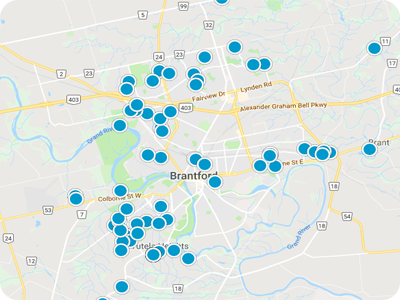 Our site Property For Sale in Brantford, provides real-time MLS Listings that are updated multiple times per day to ensure our clients are the first to know about any active listings in the St. George area.